I made a couple small modifications to the shoulders. Instead of placing a button band on one shoulder, I decided to put one on each shoulder for symmetry. I put one button on each shoulder (instead of two), and placed two decorative buttons on the bodice. 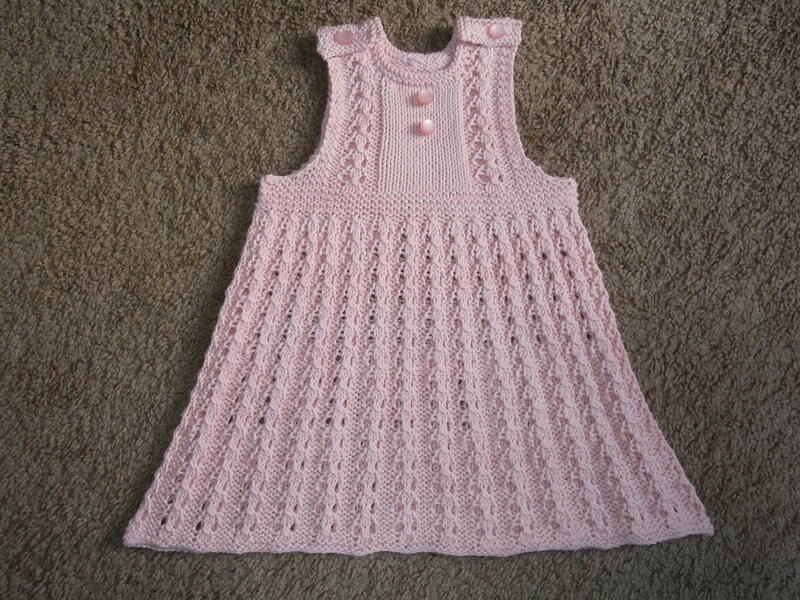 I haven’t actually measured the dress, yet, (I’ve been kind of busy with a newborn!) but I’m pretty sure it’s a 3 month size. Right now it’s tucked away in the girls’ “knits drawer” waiting for Kirsi to grow into it. I’m sure she’ll be wearing it lots this summer! It’s so pretty! The decorative buttons on the bodice are a really nice detail. I can’t wait to see the dress “in action.” And I super can’t wait to meet Kirsi in person in June! Thanks! It was such a fun project!